One area I didn't show you on the home tour the other day was our little oddly-shaped balcony. 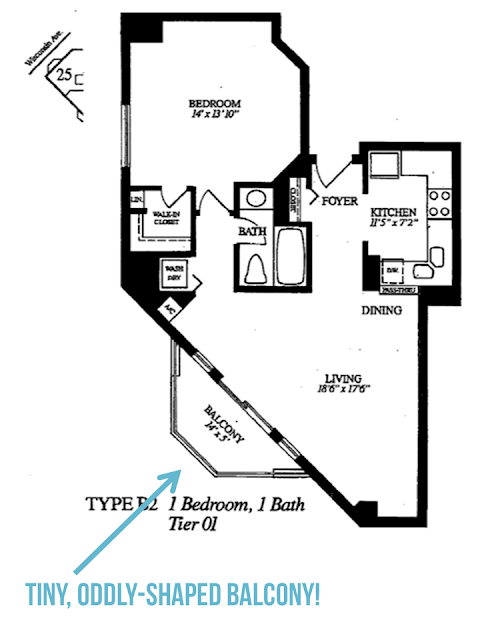 You may have noticed it in the floor plan, but I didn't mention a word about it. That's because there's hardly anything out there to show :). But, since this 31 Days series is about using and loving what I have, and I do have a balcony after all, you get to see it today! Ready to see our non-styled, non-"finished", pretty unexciting balcony? I snapped a couple of photos the other day from the best angles I could...here you go! We use this balcony all the time (as long as it's not raining). It's such a treat to be able to be outside easily and get some fresh air. I realize that's not a luxury if you live in a house, but we've always been in apartments, so outdoor space is a luxury to us! 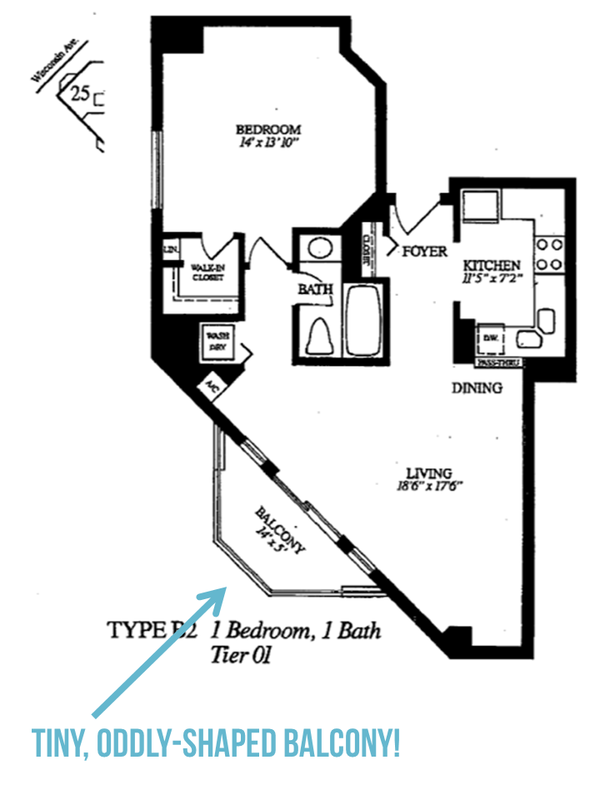 (Even if it is only 15 square feet.) It's the place I go to relax, work on my computer, and sometimes even have quiet times. It's kind of an escape for me. Our apartment faces east-ish, and overlooks a section of dense forest, so we get clear views of magnificent sunrises each morning. I'm always in awe of God's creativity when I see those faded pinks and oranges explode into bright swaths of color. It's such a treat to wake up to that each day. If I wasn't so rushed getting ready for work in the mornings, I'd love to take my cup of coffee out there and just be for a few minutes - ya know? I had/have grand plans for making this space a little more special and pretty, but that hasn't happened yet. For now, I'm ok with that. I appreciate it for what it is and I'm not worrying too much about its appearance. I'm content with having a couple of comfy rattan/bamboo chairs to sit in and a bench for my cup of coffee to rest on. The goal here is to have a designated place to just breathe (no Faith Hill song pun intended). How about you? Do you have a place in your home that you call your escape? Somewhere you can shut off the world and just enjoy the beauty around you for a few quiet minutes? I love your little balcony! The chairs are great, and it really looks so inviting. I'm not sure what you have in mind to "finish" it, but it sure looks great as-is, in my opinion! Thanks for sharing your 31 days. I'm enjoying. Aw, thanks Shay! I'd love to add a little more life to that balcony with some plants - and maybe some lights! It would be nice to be able hang out there once it gets dark :). Glad you're enjoying my 31 Days! Thanks for following along.